I've been pondering this question for awhile now. First, i'm on one side of the debate, then i'm on the other side. Intuitively, it makes sense that the soundboard (with a crown) pushes out on the rim when it's under load. Then Nossaman comes in and says that his experiments showed that the soundboard actually rotates inward at the rim. Which also can be demonstrated. Hence the back and forth. Regardless on which side of the debate you're on, here's an interesting video showing the rim moving and affecting crown. Mason & Hamlin Centripetal Tension Resonator as found in an early Model A. Troubles are Bubbles, and they just float away. Those are two different scenarios: Nossaman was talking about the panel changes as a result of down bearing, given a stable perimeter dimension. Craig Hair was talking about the effect of reducing the rim perimeter dimension, not the effect of downbearing on the panel. Ron Nossamn's point (one of many) was that increasing the downbearing makes the ends of the soundboard want to lift off the inside of the rim while bearing down on the outside of the rim. To illustrate that effect I put in Pianos Inside Out a photo of a piece of orange peel that's increasingly loaded in the middle. It looks like a dancer standing with feel far part and then lifting the heels (and remaining on toes). Many years ago Chris Robinson made a statement in one of his classes to the effect of: "If the rim expands .001" the soundboard will lose its crown...do the math". I did not "believe" him at the time, feeling that he was exaggerating, but I was not going to argue the matter either since I had no opposing data to draw on. Some time later, I presented the matter to a client who was also a math professor. I explained the issue and gave dimensions, etc and asked: "How do we go about figuring this out mathematically?" Well, he got real excited and said: "Ahhh, practical application of math...I love it!" and then proceeded to start drawing right triangles (and other stuff) and explaining what he was doing (though it was largely over my head). But, when solved for "x", the answer was in fact: .001" - .002" rim expansion to lose about 1/8" - 3/16" crown over approx 36" span. So mathematically this works out to be true. HOWEVER, since then I have been exposed to the thinking that this IN FACT does not happen...that the rim can expand and the soundboard will not lose its crown because of that. RN being (I think) a big proponent of this thinking. Re the expansion question, if it did expand, as shown in Craig Hair's demonstration, expansion would not be uniform, because of the shapes involved. One part would expand, but that expansion would reduce other areas in a push-me-pull-you scenario. Its too easy in all of this visualizing of what might be happening, to reduce a serpentine, looped structure from three interactive dimensions to a simple linear two dimensional 1+1 model. Why...because its much simple and easier to think linearly and in two dimensions. But I think there are, unfortunately, way more variables involved, which of course makes it harder to think about. One thing I do know, from observing my boards as I test load and measure them with indicators, is that the effect the perimeter glue joint has on overall and local stiffness of the structure is huge. Its huge, and I missed it for a long time. Missed it, because I visually simplified the system to conform to the limitations of what I could imagine was happening. "One thing I do know, from observing my boards as I test load and measure them with indicators, is that the effect the perimeter glue joint has on overall and local stiffness of the structure is huge. Its huge, and I missed it for a long time. Missed it, because I visually simplified the system to conform to the limitations of what I could imagine was happening." A good little demo of this is to use a paint stick. Hold one end in your hand and flick it. You'll get nothing. Clamp one end in a vice, flick it, and it behaves totally different.
" Nossaman was talking about the panel changes as a result of down bearing, given a stable perimeter dimension." But that doesn't even attempt to answer the question if acting forces expand the rim or not. has no affect on crown". Doesn't the Craig Hair video show that a force does push out on the rim. If the rim is being changed and the ribs go up and down, doesn't that show a connection between the two? In the video, Craig cut some bars such that they were arched into a tight fit in the notches in the rim. 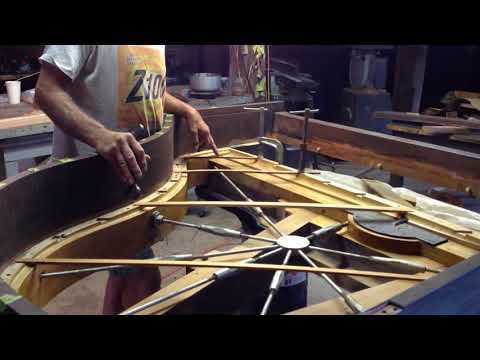 A soundboard, compression or rib crowned, is arched by its internal structure before it is glued into the piano. Think more like a dinner plate which is inverted and glued by its rim. This image leads me to think that the purpose of the M & H spider is to stiffen the rim before the soundboard is glued in, not to somehow increase the crown or "tune" the soundboard. Having seen one or two M & H's with "shredded" soundboards, I wonder if this was caused by someone tightening the turnbuckles. I think the Tension Resonator is a bracing system named very cleverly. Traditionaly, M&H has used an inner/outer rim construction. The fully strung and at tension inner rim belly is glued to the outer rim. So one desires that the dimension of the inner rim stay constant with fluctuating humidity. Voila, restrain wood movement by holding everything from expanding with the centripetal forces collected by an unmovable element. I am afraid Mr. Hairs' video will encourage more people to add tension to the spider. It is very easy to crack the rim and belly rail apart from doing this. I have seen several M&H's where this has happened. My practice when installing a new soundboard is to make sure the spider is properly tight, by ear and fist bump, and don't change it again; then glue the new board in. Since the tension resonator was mentioned this brings up questions that I have about tightening one. I have been dealing with a vibration in a 25-year old Mason & Hamlin in which the resonator seems to be vibrating sympathetically with notes in the midrange. If I hold it while the note is played the noise stops. It is a very subtle mouse but there, nonetheless. My questions have to do with how careful I need to be about tightening the vibrating member. Can this be done with the piano under full tension? Should I go around to all three and add a little tension all the way around or just to the one that seems to be generating the noise? How do I know if I've gone too far? I don't want to wait until the rim cracks to get my answer to that question! Basically, I'm with both Eds on this. If one does not have that luxury, then one's choices are more limited. who somehow think that the resonator was installed to "adjust"
to see if there is any change in the tone/pitch/volume of the buzz. kind of new/different noise; and repeat the above as may be necessary. to carefully check the work. insofar as it can realistically be reductively analyzed to death. work (or, for that matter, have done more than a few thousand tunings). Hope that this is somewhat helpful. If not, use the delete button. > Please do not forward this message due to Auto Login. > Since the tension resonator was mentioned this brings up questions that I have about tightening one. I have been dealing with a vibration in a 25-year old Mason & Hamlin in which the resonator seems to be vibrating sympathetically with notes in the midrange. If I hold it while the note is played the noise stops. It is a very subtle mouse but there, nonetheless. > My questions have to do with how careful I need to be about tightening the vibrating member. Can this be done with the piano under full tension? Should I go around to all three and add a little tension all the way around or just to the one that seems to be generating the noise? ? ?How do I know if I've gone too far? I don't want to wait until the rim cracks to get my answer to that question! > I think the Tension Resonator is a bracing system named very cleverly. > Traditionaly, M&H has used an inner/outer rim construction. The fully strung and at tension inner rim belly is glued to the outer rim. So one desires that the dimension of the inner rim stay constant with fluctuating humidity. > Voila, restrain wood movement by holding everything from expanding with the centripetal forces collected by an unmovable element. > I am afraid Mr. Hairs' video will encourage more people to add tension to the spider. It is very easy to crack the rim and belly rail apart from doing this. I have seen several M&H's where this has happened. > My practice when installing a new soundboard is to make sure the spider is properly tight, by ear and fist bump, and don't change it again; then glue the new board in. > In the video, Craig cut some bars such that they were arched into a tight fit in the notches in the rim. > A soundboard, compression or rib crowned, is arched by its internal structure before it is glued into the piano. > Think more like a dinner plate which is inverted and glued by its rim. > This image leads me to think that the purpose of the M & H spider is to stiffen the rim before the soundboard is glued in, not to somehow increase the crown or "tune" the soundboard. > Having seen one or two M & H's with "shredded" soundboards, I wonder if this was caused by someone tightening the turnbuckles. > " Nossaman was talking about the panel changes as a result of down bearing, given a stable perimeter dimension." > But that doesn't even attempt to answer the question if acting forces expand the rim or not. > has no affect on crown". > Doesn't the?? Craig Hair video show that a force does push out on the rim. If the rim is being changed and the ribs go up and down, doesn't that show a connection between the two? > Troubles are Bubbles, and they just float away. > "One thing I do know, from observing my boards as I test load and measure them with indicators, is that the effect the perimeter glue joint has on overall and local stiffness of the structure is huge. Its huge, and I missed it for a long time. Missed it, because I visually simplified the system to conform to the limitations of what I could? ?imagine was happening." > A good little demo of this is to use a paint stick. Hold one end in your hand and flick it. You'll get nothing. Clamp one end in a vice, flick it, and it behaves totally different. > Re the expansion question, if it did expand, as shown in Craig Hair's demonstration, expansion would not be uniform, because of the shapes involved. One part would expand, but that expansion would reduce other areas in a push-me-pull-you scenario. Its too easy in all of this visualizing of what might be happening, to reduce a serpentine, looped structure from three interactive dimensions to a simple linear two dimensional 1+1 model. Why...because its much simple and easier to think linearly and in two dimensions. But I think there are, unfortunately, way more variables involved, which of course makes it harder to think about. > One thing I do know, from observing my boards as I test load and measure them with indicators, is that the effect the perimeter glue joint has on overall and local stiffness of the structure is huge. Its huge, and I missed it for a long time. Missed it, because I visually simplified the system to conform to the limitations of what I could? ?imagine was happening. > You are subscribed to "Pianotech" as hgreeley@sonic.net. To change your subscriptions, go to http://my.ptg.org/preferences?section=Subscriptions&MDATE=756%253e457467&UserKey=3feecf45-4a69-4cff-bbb2-fd6c7eaf0569&sKey=KeyRemoved. To unsubscribe from this community discussion, go to http://my.ptg.org/HigherLogic/eGroups/Unsubscribe.aspx?UserKey=3feecf45-4a69-4cff-bbb2-fd6c7eaf0569&sKey=KeyRemoved&GroupKey=2bb4ebe8-4dba-4640-ae67-111903beaddf. First, how about stuffing a rolled up sock between the resonating rod and a beam or even the soundboard? That's not the first time I've been told to "Put a sock in it!" But, seriously, I'll try that first! Thanks.